From a previous post I mentioned that there were two famous films that were made in places that I had lived. The first film was “Groundhog Day” which was filmed in Woodstock, Illinois. 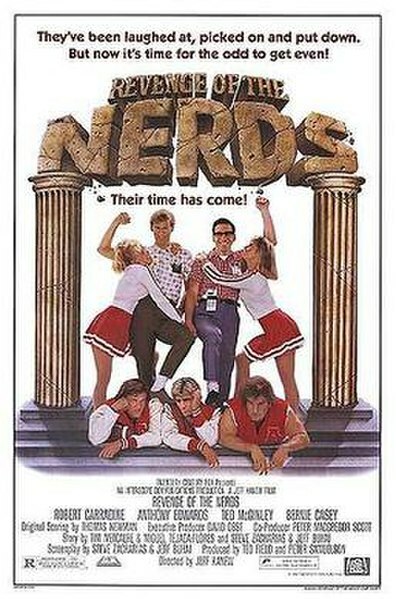 The second film is “Revenge of the Nerds” which was filmed at the University of Arizona in Tucson, Arizona. Unlike “Groundhog Day” which was filmed in the early 90s, I was actually at the university when “Revenge of the Nerds” was made in 1984. The student body was quite excited about this film being made due the the opportunity of actually being in it as extras. A guy down the hall from me in the dorm not only got to be in the movie but also managed to tell a short joke towards the end. The movie crew transformed sections of the campus to look like Adams College and used many existing university buildings to host the scenes. I remember them shooting a scene with the coach where he barks out a few commands in front of the dorm and then zooms off in his golf buggy. It was a few years before I realized that this was John Goodman. Guys from the dorm went down one night to the fake fair that the movie crew had built. Unfortunately a few of us already had too much and one of us decided it would be a good idea to try and steal a stuffed animal off of the display of a fake game. He almost managed to bring down the game in the attempt to remove the animal. The security guards noticed and soon he was running with said stuffed animal down the street back towards the dorm. The police busted him about one quarter of the way back. I didn’t see this happen since he had run pretty fast. I seem to remember that we had dared him to do it and couldn’t believe he had actually done it. The police let him go after the movie group decided not to press charges. In fact, the movie group was very generous about all crimes committed against it. As long as the culprits returned the items, they were not charged. There were several fraternity pranks pulled involving stealing lots of big props. I guess real life was trying to match the level of what the movie would show. It seemed the fraternities were testing their pledge classes with more and more brazen attempts. All of us at the university would read about it in the school newspaper the next week. The most brazen was perhaps stealing a banner that fit against the back of a football scoreboard at the main outdoor stadium. It was massive! It was meant to cover the U of A logos with its own “Adams College” version. It was returned but I never understand how they did it in the first place. It was so big and heavy that they would have needed crews of people to pull it off. It’s hard to believe that “Nerds” was filmed so long ago. I can remember a few more bits based on what I heard from the students that worked as extras. The rumour was that the director was trying to replicate some of the same feeling as “Animal House” but with the twist of the nerds striking back. There were also many stories about the crew attempting to recreate party atmosphere by sponsoring free parties for the extras. I haven’t seen the movie recently but whenever I see it, I have minor flashbacks to people and places I haven’t seen for years. It’s good to see old faces and places from time to time. As for the movie itself, I don’t think I can get very philosophical about it this time. Perhaps I’ll just say that nerds are people too. Oh, and nerds are more likely to bloom late. That’s more than I can say for my high school football captain. He peaked in high school. Last I saw him years ago he was working as a security guard at the local convention center in Tucson. That might be construed as being a bit mean when really that wasn’t what I intended. The point is that if you do your best too early, you are unlikely to succeed later in life. I think it has something to do with believing your own hype too much when really you need to continue to grow. Well, I guess I managed to get philosophical after all. Oh, there is one thing this movie proves. If you are a nerd that bucks the system, you are likely to end up going out with the cheerleader. I wouldn’t have figured that. I guess that is the surprise ending.